At long last, now that I have successfully vanquished Malistaire and am busy exploring the mysteries of Celestia, I have decided to start playing my special project, Destiny Hexcrafter, again. For anyone who doesn’t know, Destiny is a Necromancer I’m playing who has no gear and no special robes – basically I’m playing her with the robes, wand, and spell deck she got from Headmaster Ambrose. After playing Digby for so long, going back to Destiny is very challenging, especially since between the gear and spells I have with Digby he’s practically a super hero. Currently Destiny is at level 21. She has 940 health, 58 mana, and an 18% chance for power pips. The mana isn’t a huge problem any more, but 940 health goes fast! I’m deep in the heart of Krokotopia – how I love Krokotopia! Today I decided to try some of the very fun Halloween quests – the jack o lanterns and ghost catching was great, but then I had to go fight the ‘Baron of Nightmares’ – a 2000 health death boss is a little out of Destiny’s league! I’ll keep trying though, I’m sure I can get him eventually. I think it will take some clever use of treasure cards, but I’m pretty sure I can do it. So that’s Destiny Hexcrafter – I’m excited to be playing her again, and I’ll try to update you with her adventures more often! This entry was posted on October 14, 2011 by dittowizard. 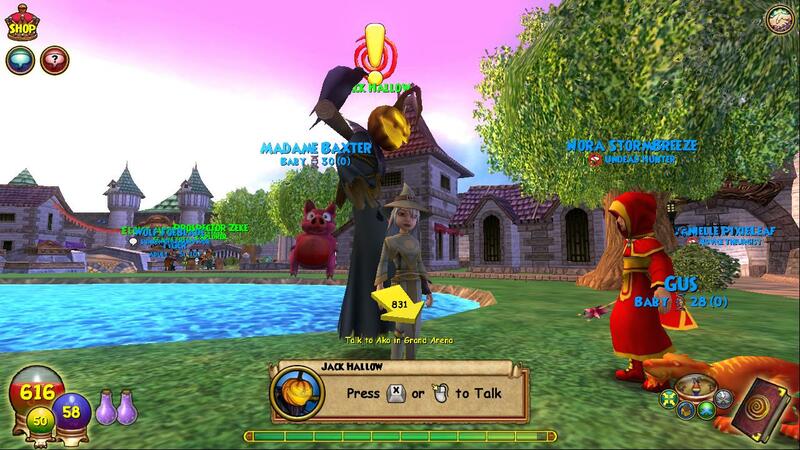 It was filed under Destiny, Wizard 101 .
hey ditto. the friendly necromancer is doing the same thing with a wizard he calls angus. he is already mostly through dragonspyre. i doubt he can solo malistaire though. The baron will be really easy once you have feint. All you need to do is blade trap prism and feint on him and a vampire so that you can easily kill the minion.